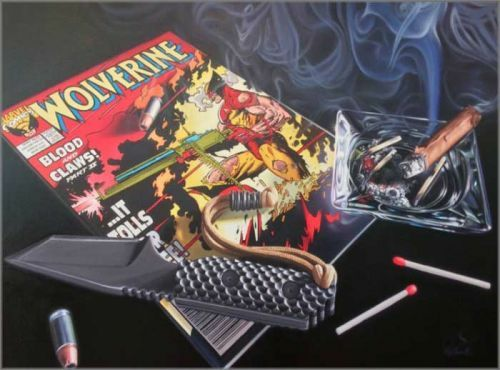 Doug Bloodworth limited edition giclée on canvas:"Wolverine"
About the Art:You are probably either a Wolverine fanatic or you are looking for a special holiday gift for him and this might fit the bill just perfectly. Do you notice not only the smoke from the cigar, but also how the light hits the smoke in different places and how the tone is different as a result. How amazing is that? Even after a year, you will still notice new things in the painting whenever you look at it. Look at the the handle of the knife. Look at the shadows on the bullets, and the shadows that the bullets create on the book. Wow. Doug loves inserting unique things that take careful viewing to notice. For example, look at the top left corner:it says "Under No Circumstances Should You Read This". It also says "Approved by the Justin & Bini Authority". Bini is Doug's daughter and Justin is her husband! There are other things like that as well, and you will notice one at a time over the years.